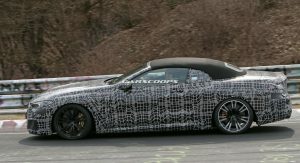 The Mercedes-AMG S63 Cabriolet better watch its back because the BMW M8 Convertible is edging closer to production. 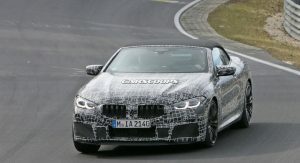 Currently being developed alongside the M8 Coupe and M8 Gran Coupe, the Convertible will replace the M6 cabriolet and allow the German automaker to explore a segment of the market which it hasn’t previously competed in. 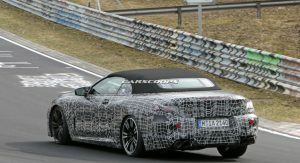 These scoop images, snapped of a camouflaged M8 Convertible testing on the Nurburgring, offer an excellent look at the vehicle’s muscular lines and low-slung profile. 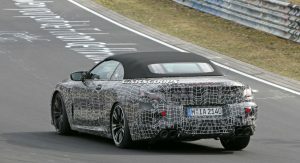 It doesn’t just make the M6 Convertible seem bloated and overweight, but even makes the attractive S63 Cabriolet seem a little too beefy. 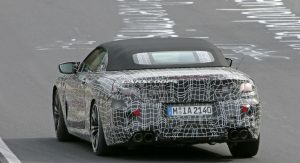 Key points of difference between this prototype and lesser 8-Series Convertibles spied recently include a more aggressive front fascia, big brakes, distinctive wheels, and quad tailpipes at the rear. 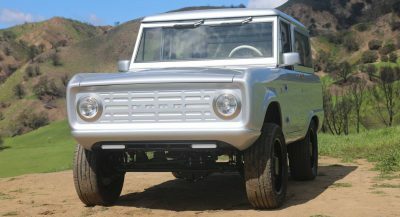 Also expect differentiated slats for the oversized kidney grilles and a slew of bespoke interior touches ranging from the dashboard and door trimmings to the body-hugging sport seats and digital instrument panel gauges. 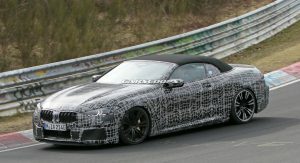 Like its siblings, the M8 Convertible will be powered by a 4.4-liter TwinPower Turbo V8 engine delivering in excess of 592 hp and up to 630 hp. 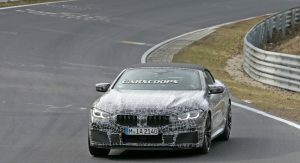 If BMW pairs the engine with an all-wheel drive system, both the M8 Coupe and Convertible may out-accelerate the M5 in the sprint from a standstill to 100 km/h (62 mph). 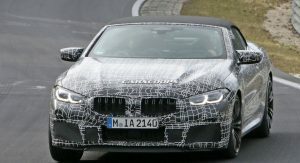 Based on BMW’s latest modular platform called CLAR (cluster architecture) with unique wheelbase and track widths, the performance variant of the 8-Series will sport a uniquely tuned double wishbone front and multi-link rear suspension, while also featuring rear-steer function to further improve handling. 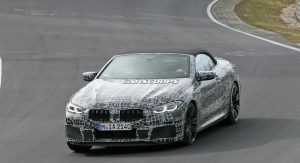 The complete M8 family should be out of the bag by the first half of 2019 but as of yet, no official launch dates have been made public. 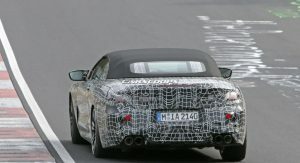 nicecameo beemer…now we all know what it looks like..
V12s are only for their flagship saloons now and I heard a rumor BMW was going to phase it out. They should lean towards their concept designs a little more. 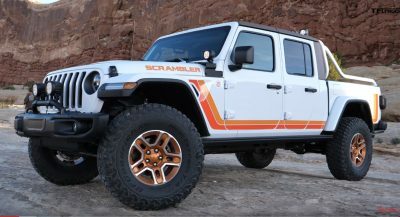 This looks way too familiar already. 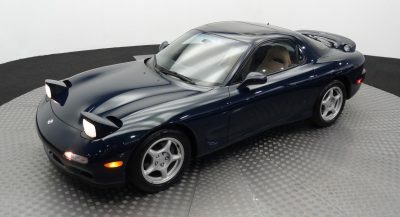 Maybe I’m not the target demographic, but…this car just doesn’t look all that special. 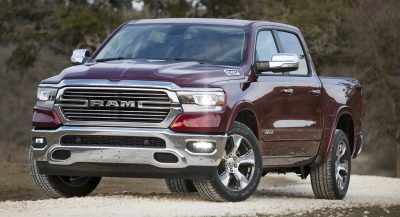 It better be nice inside, and it better drive amazing, because the overall exterior shape reminds me of a 2000-era Mitsubishi Eclipse convertible. 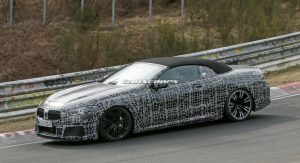 Next PostNext Lamborghini To Launch Fourth Model Between 2025 And 2030; What Do You Think It Should Be?